the chords are very simple and familiar, so the only real challenge is to practice the strumming patterns. the basic ones are easier to play and sing at the same time, but the detailed ones sound more close to the original. you can do it! thanks so much for watching, and i hope this helped! please make sure to comment, like, favorite, share, leave a video response and/or subscribe for more tutorials like this in the future! i really appreciate your support! 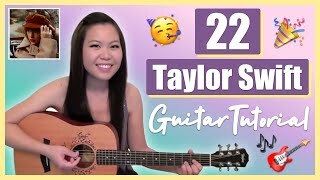 "22" - Taylor Swift EASY Guitar Tutorial/Chords (No Capo!) ... hey everyone! ^^ this is my guitar tutorial for taylor swift's song "22" from her RED album!